MetaEzra -- So How's That Campaign Coming? So How's That Campaign Coming? Launched in the fall of 2006, it's been almost four years since the 'Far Above' capital campaign was publicly announced. 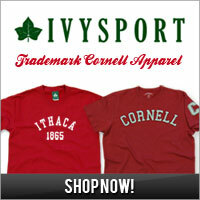 At the time, three billion had been targeted for the Ithaca campus with an additional one billion for Weill Cornell. Today, $2.758 billion has been raised, far above the $1.258 billion we were at three years ago in June of 2007. But obviously the campaign has been hindered by the depths of the great recession. 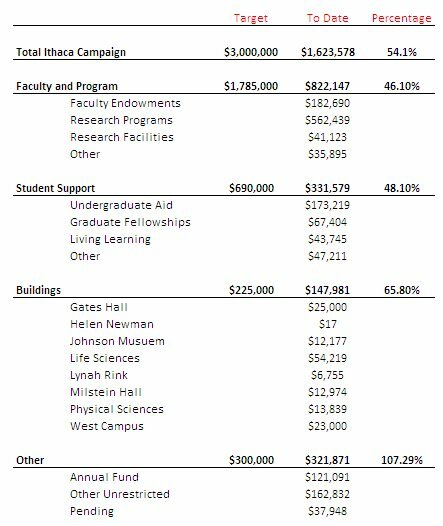 The Ithaca campus campaign stood at $1.623 billion as of March 2010. You can probably add to that the $125 MM in gifts that were announced over Reunion weekend (including the Dyson gift). That brings the sum to $1.748 billion. 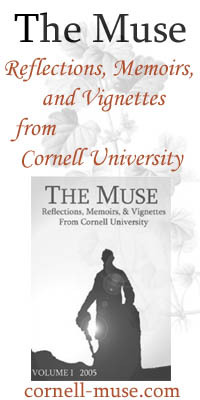 What's interesting is how much father along the Weill Cornell campaign is. If you net out the difference between the Ithaca subtotal and the campaign total, the Weill 'Discoveries That Make a Difference' campaign stands at $1.01 billion, a bit over its original goal and at 78 percent of its new goal of $1.3 billion. (The amount must have been increased to $1.3 billion somewhere along the way, although the Far Above campaign website still lists an overall $4 billion goal). So apparently wealthy New Yorkers care more about life-saving research and services than basic research and education a five hour drive from Manhattan. Below the fold is a more exhaustive breakout of the Ithaca campaign totals, courtesy of the 2010-2011 financial plan. -- It's a bit disappointing to not see more support for undergraduate financial aid, as this is an area the University sorely needs investment in. -- It's also interesting to note than aside from the original $25 MM from Bill Gates from four years ago, there's been no additional activity on Gates Hall. Surprising given the number of Cornell alumni active in Silicon Valley. -- The University has probably been directing more gifting activity to Annual Fund and unrestricted support avenues in recent years due to the ongoing budget crunch. -- That $10MM Milstein gift sure looks paltry given the way the budget for the building exploded from $30 MM to $55 MM. -- Any speculation as to where the additional $100 MM in gifts that were announced by Skorton at Reunions will be funneled? Perhaps Gates Hall, the physical sciences building, or undergraduate aid. Late Update: Reader NG writes in to mention that in Skorton's State of the University address he indicated that the $100 MM in gifts will address faculty renewal, increase our stature in cross-cutting fields such as sustainability and cancer genetics, and support our international programs. Somehow I missed that in my tweeting effort. So none of the three possibilities I mentioned above.